Tap pour at Washington Cider Week 2015 kickoff event. 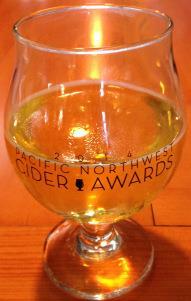 This cider is a special release (August 2015) Seattle Cider did with the Fairmont Olympic Hotel, and only available at Seattle Cider (tap & bottles if they have any left) and the restaurant/bar at the Fairmont Olympic Hotel. This used honey from the rooftop apiary at the hotel. I had really wanted to try this after seeing a segment they did on King 5 local news on Facebook, so I was pleased they still had some. Semi dry. I picked up only hints of honey, but it was refreshing, and probably my favorite Seattle Cider variety so far (I’m not a huge fan of their ciders, although they have a large local following). Moderate acidity and and mild tartness.